Blossom-filled days have finally reached the place I live. I’m feeling relieved and delighted in the beauty around me. The transition between winter and spring this year was harder than usual. It hasn’t helped that we have been dealing with difficult transits recently—eclipses, a grand cardinal cross involving the 5th of seven exact squares between Uranus and Pluto, and a debilitated Mars moving retrograde through Libra are some of the stressors. I’ve written about these transits for the last two months, so I won’t go into a big explanation about them right now. Here’s the gist: We moved through a difficult time of transition the last couple of months and have more or less come through to the other side. This is a good moment to take our bearings. Exhale into the last days of the Taurus lunar cycle. The next inbreath comes at the Gemini New Moon on May 28. Earth, through the sign of Taurus, had been the teacher and the gift-giver during the lunar cycle* ending this week. Earth has its own methods for processing change. Did you notice the power of compost and regeneration? This month, I suspect I have developed more trust in this process. I’ve learned I don’t have to control it. Showing up for the challenges of change with integrity (another earthy quality), I can simply surrender to the inevitable processes of death and rebirth. Another gift: not having to over think it. Taurus teaches about simplicity—knowing when enough is enough. Gratitude naturally bubbles up from this awareness. This in itself is another transformative power offered by the gift-giving Earth. I like moving forward. The longer and sweeter days of spring are beckoning. This Gemini season is expansive. There is much to learn and experience, however I want to take one last moment to reflect before moving on. On the other side of difficult transitions like we’ve just experienced, we benefit from anchoring into our bodies the simple, yet powerful blessings of Taurus. There is healing balm here. Here, there is wisdom to get us through future times of change and challenge. Sunday, May 25. Early morning activities are energetic and pleasant. An Aries Moon makes favorable contacts with Venus and Mercury. People are feeling social. That energy may peak early, however. The Taurus Moon in the early evening (CDT) encourages more sensual experiences. The Moon returns to the same sign that began this lunar cycle. The old Moon energy tones down the expansiveness of the morning. Don’t be surprised if you crave more quiet or solitude over the next two days. Our bodies are integrating the experiences of the Taurus lunar cycle. Take care of yourself. Monday, May 26. Drink in the pleasure of spring. This morning, the Moon favorably contacts Neptune. We may prefer to stay in bed a little later and keep dreaming. But if you do need to get up, give yourself space to listen to your heart, your spirit, or your gods. Mystery is speaking. Later when the Moon trines Pluto, we feel the strength of earth bolstering us. What is the take away lesson of this lunar cycle for you? Find a way to honor that insight with a concrete action. Plant a seed. Tuesday, May 27. Let yourself drift a bit today. Rather than fight it, try to step between the worlds. The very last day of a lunar cycle, which happens to also have a void-of-course Moon, is not a time to try and muster a lot of energy toward new beginnings. Honor the past, find pleasure in the Earth, feed your senses, putter around making something but without much attachment to outcome—all these things could feel richly rewarding today. The soil has been prepared; take a moment just to feel the expectancy of what that garden will produce. May 28—New Moon: Dreaming. The lunar cycle begins today with a Gemini inbreath. Gemini just may be the airiest of the air signs. Because it is a mutable sign, Gemini is expert at shapeshifting, delights in learning, and craves sharing information. The sign of the Twins evokes all types of polarities and the dance between them. Like a dandelion seed floating on the breeze, Gemini gets somewhere by being carried by the air. It can look like there isn’t a plan, but that is the tricky nature of this sign. The plan is the process itself. Breathe in. Molecules in that breath connect us to very formation of this planet. Breath out. We’ve just participated in a grand, and impossibly complex moment of co-creation. Breathing has impact. Effort can take many forms. What will you dream into being this lunar cycle? How will you be inspired by the mysteries of breath and thought? After the gravity of the last lunar cycle, it’s possible that the most profound thing we could do now is lighten up. An inbreath. A mutable moment. Geminis are often not taken seriously, but that doesn’t mean that the Gemini superpower isn’t incredibly important anyway. We can either think that floating from thought to thought is just a pleasant way to spend a spring day, or we can think we are keeping the very fabric of reality in place; it doesn’t matter. Gemini will still do what Gemini does best. Let that breath fill you. Then let it go. Another breath is on its way. First things first. In the chart for the New Moon, Mercury, the ruler of Gemini is at the last degree of that sign and is preparing to turn retrograde in just a few days on June 7. Mercury will retrograde and then move forward again while in Gemini from June 17 through July 12. All the ways we can develop an appreciation for Gemini during this lunar cycle will help us make the best use of this retrograde transit. Yes, sometimes Mercury retrograde can upset the cart, so to speak, but think of all the gifts. New perspectives. Refined communication tools. Serendipitous ingenuity. A chance to repair computers…to lose and find objects…to develop a sense of humor… All of this is possible. Second things second. 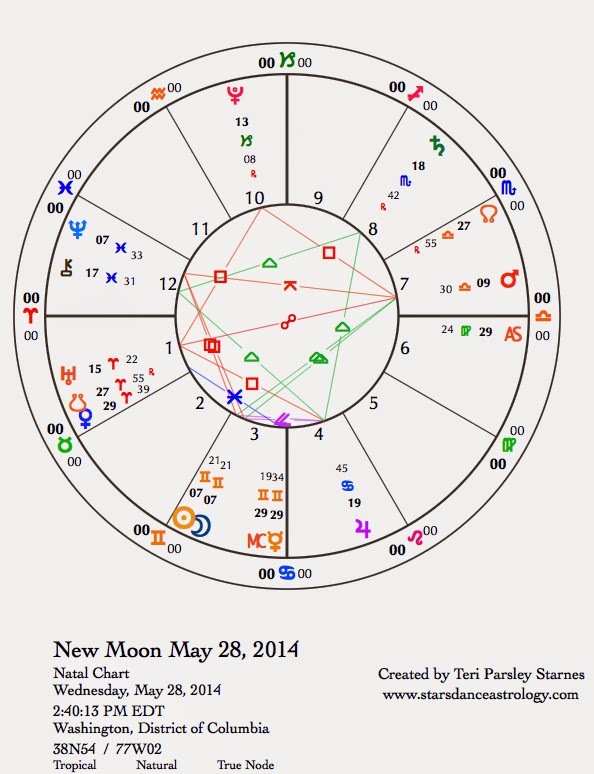 In the New Moon chart, Mars has just stationed direct and is in challenging aspect to Uranus and Pluto. Later in the lunar cycle, these aspects will become exact. This is the final act of the grand cardinal cross aspect pattern of the last few months. All the time we’ve spent reflecting on relationships, justice, and balance may now be applied with bold action. It will be a good idea to keep in touch with an intention of compassion and restraint this month as we do so. Fortunately, a grand water trine will help us to be more emotionally centered as long as we are willing to apply ourselves to that intention. Sometimes a grand trine, which means all the signs of one element are activated, can be a wasted opportunity unless we consciously work with it. During this airy season, water helps to ground us back into responsibility in our relationships. We don’t want to hurt others by distracted detachment. The planets in this trine are Saturn in Scorpio, Jupiter in Cancer, and Chiron in Pisces. Saturn helps give form to our hopes for healing and hearth connections. This grand water trine will last until the Full Moon on June 13. The Sun and Moon in Gemini form an exact square to Neptune in Pisces. We will have to watch out for the easy option of escapism this month. When we manage to return to our bodies (remember, this is the gift of the last lunar cycle in Taurus), we experience useful as well as transcendent states of spiritual connection. Magic is all around us. This is not an illusion if it reminds us of our human obligations to all of life. Venus enters Taurus this evening for the next three weeks. Let the beauty you love, be what you do. Thursday, May 29. There is a tendency to drift today. Remember the dandelion seed floating on the air? How are you like that seed today? Know yourself. Do you let the wind take you or do you need to keep hold of a grounding cord? Play with minor adjustments. See what happens next. Stay curious and accountable. Friday, May 30. The watery sides of our natures are emphasized as the Moon enters Cancer. Mercury encourages tender-hearted communication. Here’s the deal. If you are an airy type, the energy of the last couple of days may have tempted you to act without thinking about how others might feel. Now you are reminded of that mistake. Be willing to admit you made one. If you are the one with hurt feelings, it may help to try and lighten up a bit. But don’t be afraid of your feelings. The grand water trine from Saturn, Jupiter, and Chiron is asking for emotional honesty. Saturday, May 31. Some hens come home to roost today. Thoughts and actions have impact. Can we accept responsibility for our relationships even if we don’t feel we did anything wrong? The Sun trines newly-direct Mars in Libra. We are energized to act, especially in the realm of thought and word. The Moon’s agenda is in the realm of emotional experience. Hurt feelings surface. We may notice how the qualities of mind and heart sometimes don’t easily mesh. However, Mars helps us negotiate if we are willing to be fair to all sides. Shoes are dropping all over the place this week. We’ve been waiting since the beginning of this lunar cycle* for the other shoe to drop and release expectations engendered by the grand cardinal cross aspect pattern of these last few weeks. The first shoes dropped when the cross was exact at the end of April and then at the solar eclipse at the New Moon. What seemed to occur for many folks during this time was a slow boil rather than a big eruption. The planets of the grand cross, Pluto, Uranus, Jupiter and Mars, were pulling equally in four distinct directions. It felt like ominous storm clouds sitting over our heads but never actually raining. It was intense, but not much happened to change the pressure. The transits of this week, involving Venus and Mercury, may end the planetary standoff and move things along for both good and bad. Isn’t that the way it always goes? We can’t stay stuck forever. Choices will be made—some of them mindfully and some without much thought. Isn’t that the way it always goes too? Both types of choices will move us along our evolutionary journeys. Venus in Aries will be contacting all the planets of the grand cardinal cross this week and next through aspects that tend to provoke reactions—conjunctions, squares, and oppositions. All the Venus areas of concern, which include: values, money, resources, relationships, women, and justice, will more noticeably provoke strong reactions. Venus normally feels more comfortable in Libra, the sign opposing Aries, so people may not be very gracious as they go about expressing dissatisfaction. This is a good time to try and remember our manners when we need to get a point across or to give someone who is being uncharacteristically rude a little more leeway. The pressure could be getting to us all. The good news: We get a push to engage with the forces of change. Everyone is less likely to feel ambivalent about injustice. The challenge is to use our skills for negotiation and activism mindfully. Mercury in Gemini is very busy this week. Think pollinator. Think instigator. Life speeds up. We have a lot of networking to do. Mental energy is high. However, a grand water trine between Saturn in Scorpio, Chiron in Pisces, and Jupiter in Cancer mellows this frenetic energy. This water is grounding us into heart-centered being in the midst of stress and uncertainty. The goal is to soulfully bring healing to our deepest selves. There is a felt sense that self-love leads to a larger sphere of connectedness. From this place, our choices are informed by our impact. This lunar cycle, I have dedicated myself to falling in love again with the Earth. Love creates vulnerability when I expose myself to disappointment. Even though it is uncomfortable, this vulnerability signals I haven’t shut down. I’m still alive and able to be in relationship. This past week, scientists confirmed that climate change is already well underway. Many of the negative effects, like species extinctions and rising sea levels, are now unavoidable. The transits this week: Venus in Aries contacting the grand cardinal cross, Mercury in Gemini activating us to learn and connect, and the grand water trine sensitizing us to our feelings, play a role in how we go forward into this future on our beloved planet with our hearts fully open. Sunday, May 11. The day begins with Venus in Aries opposing retrograde Mars in Libra. This is a crucial stage of this retrograde journey for Mars, which essentially began when Mars entered Libra in December 2013. Mars will not leave Libra until July. While Mars has been spending extra time in this sign, we’ve been evolving the way we do relationship. We’ve had to spend more time realizing that we are not alone, our actions impact others, and we need to bring a greater sense of fairness to our partnerships. Frankly, I think one reason the grand cardinal cross has not been more calamitous is that this Mars has moderated our reactivity. Now, with Venus and Mars opposing each other from the sign that the other rules, we have the opportunity for big aha moment. What is it all about? I talk a lot about balance. This transit takes balance to a new level. What will bring better balance into your life? The continuum is between selfhood and partnership. Finding our own balance between these extremes may help us see each other for who we really are. This is only one part of the dynamic of today. The Moon contacts the planets in the grand cardinal cross also, so we can expect that the relationship focus of the day may mean we need to talk out big feelings. Be careful. With Mercury square Neptune, it could be hard to find clear words. Feelings rise up that are hard to capture in any kind of rational way. Try to be patient with your heart. Monday, May 12. After yesterday’s muddled attempts to communicate, we may really appreciate the clarity coming from a trine between Mars and Mercury today. Know what you want and trust the words to come that will help you on your way. Tuesday, May 13. The momentum of water leads us to the lowest point. That’s a good direction to head today and tomorrow with the Moon in depth-seeking Scorpio. This doesn’t mean we have to be glum or sad. In fact, if we can readily acknowledge our true feelings, no matter what they are, we may be able to tap into the vitality inherent in this Taurus season. The Moon’s contacts with Neptune and Pluto favorably prepare us for the illumination of the Full Moon tomorrow. Pay attention to your intuition; treat your insights as serious information to be acted upon. Have you been denying what you know? Take a different tack. 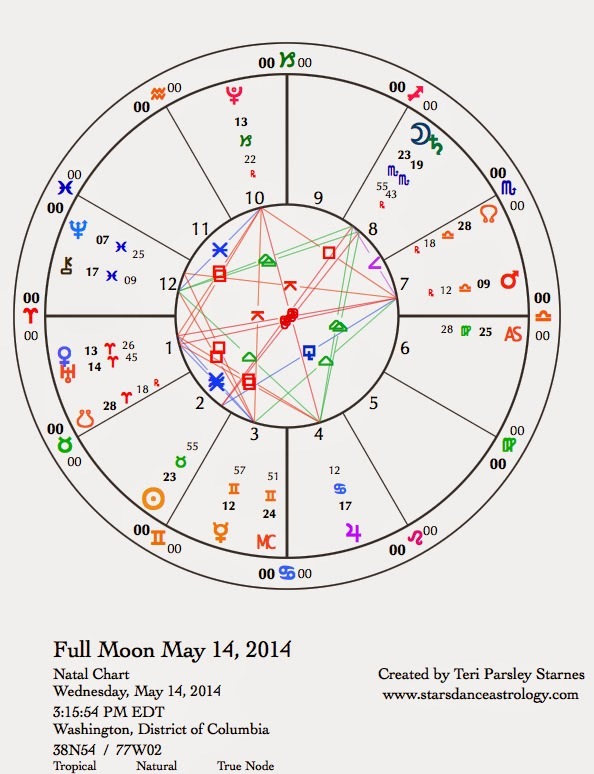 May 14—Full Moon: Illuminating. The Full Moon in Scorpio opposes the Sun in Taurus today. These two signs remind us that death and life are inexorably linked. We can’t have one without the other. Illumination comes from the realization that we can’t control any of it—the impulse to live nor the reality of death. There are forces larger than our dreams, larger than our resistances, larger than us. And somehow, rather than being discouraged by this primal exchange between death and life, I am filled with wonder and gratitude. I am awed by this power. Mixed in with this power are the seeds of this lunar cycle’s intentions. What is growing? What is dying? What is the nature of the exchange between you and these forces? I intended to fall in love with the Earth again in this Taurus cycle. I knew that would not be hard to do. What is hard is staying open to this love even as death creeps into everything that I cherish. Perhaps you are noticing this solemnity as the backdrop for a busy and dynamic Full Moon chart. In the chart for the Full Moon the planets of the grand cardinal cross have moved out of orb, indicating that some of the pressure we’ve been feeling the last month is releasing. Venus and Mars play a big role in how we move forward. Venus in Aries is square Pluto. With Venus in this combative sign being provoked by forces outside our control, we feel more defensive and likely to react. Suspicions are aroused. We need to get to the bottom of things. Since Venus rules Taurus, there is a possibility that a strong desire to uncover corruption will end up regenerating parts of our lives that really need to be transformed. The way out of dark feelings may be to move right through them. Mercury is also aspecting Pluto through a quincunx. This aspect emphasizes paradox and truth telling. It may hurt to expose a secret we’ve held for too long, but the truth can set us free. Mars in Libra is stationary at this time. This means the red planet of passion is slowing down to turn direct on May 19th. At the stations, a planet is stronger. In the sign of justice and balance, Mars adds pressure on us to find these qualities in our lives. In spite of strong impulses to act forcefully, we also must attend to the impact of our actions. Jupiter’s trine to Chiron sensitizes us to shared feelings. The dichotomy is between feelings of personal injustice and the realization that all of us are injured when toxic systems are in place. Thursday, May 15. With the reverberations of yesterday’s Full Moon still resonating, we get another jolt. Venus conjoins Uranus today. Daring to dwell in freedom and authenticity is the prime directive. Beauty is an incredibly strong force. As the planet aligned with beauty, Venus has stronger impact than we might think from the standard way beauty is trivialized in our culture. Uranus helps us realize the ways we have compromised ourselves into superficiality. And we want to break free. We have help to overcome stagnation from Mercury in Gemini. The quicksilver, trickster planet is making helpful aspects to both Venus and Uranus. Let us encourage acts of creative ingenuity—a quality of the Compassionate Trickster that astrologer Caroline Casey often speaks about. Friday, May 16. Go to the edge of your comfort zone and discover a new unifying truth. The Moon in adventurous Sagittarius is encouraging travel of all sorts. We don’t have to go far physically, to go far mentally. Diverse and surprising perspectives may challenge, as the Moon opposes Mercury, but we also find new allies with the Moon in trine to Venus. The desire to be expansive on a fine spring day at the end of the standard work week has us crowing, TGIF! May 17—Disseminating Moon: Sharing. Every lunar cycle is a story, a myth of our own telling. I am committed to tracking the phases of the Moon each lunar cycle because the framework helps me to envision where I want to go, to reflect on where I’ve been, and to be aware of where I am right now. The disseminating phase of the Moon is a great time to reflect on where we’ve been recently and what we are taking away from the experience. Think back over the Taurus lunar cycle that began on April 29. Did the beauty of the Earth call you into life? What were the struggles? What were the gifts? Another way to think of this: What are you grateful for, right now in this moment? A part of that gift was given to you at the New Moon, because that happens at every New Moon. We are moving through transformative times. There is evidence of this in the transits today. The Moon in Capricorn attunes us to the long vision of history. We want to follow through with significant, structural change to the important facets of our lives. Things matter deeply. Mercury is square to Chiron. Communication could be difficult but the difficulty is only an indication of its importance. It matters that we are true to our whole selves.